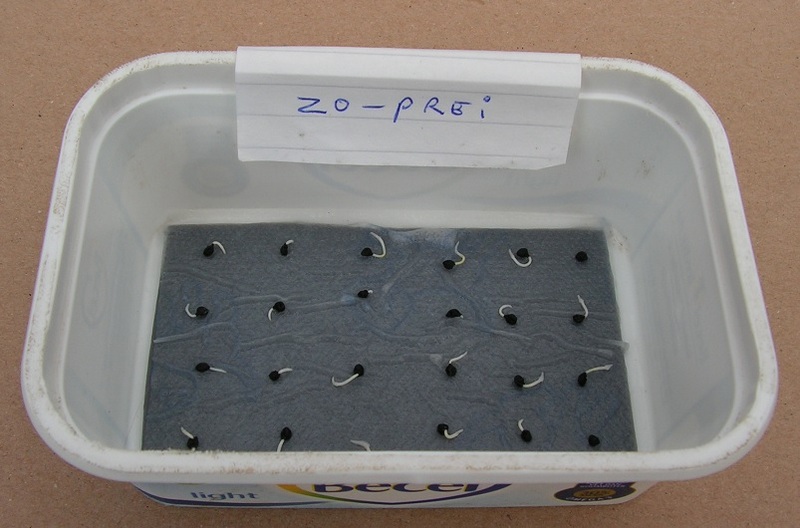 Z)# Grow leek indoors in “shove trays” filled with sowing soil. A)# Jerry’s method. Sow indoors in a tray, replant in small flower pots or in a plastic tray. B)# Method on Dutch video. Sow indoors in a big plastic flower pot. C)# Diana’s method. Sow indoors in a tray. Lift the block of sowing soil with all leek plants + roots from the tray. D)# Sjef’s old method. Sow indoors in small plastic flower pots. From March (early spring) on you can buy small leek plants in a garden shop, 4 leek plants for €1.00. When you want to grow only a few leeks, buy small plants in the shop and plant them in the garden soil. Info about planting leeks in tip 36 . When you want to grow many leeks in your garden soil, you can sow leek yourself and grow bigger leek plants. Sow indoors in December or January (mid winter). Grow the leek plants indoors at a light place at about 17 to 23 C (62 to 73 F). Plant the leeks in the garden soil under a tunnel greenhouse at the end of the winter (beginning of March). Let the leeks grow thicker in the greenhouse. Plant the leeks in the garden soil when the stem is as thick as a pencil (or thicker). Below there are 5 methods of growing early leeks indoors. With descriptions and photos. When you want to sow leeks in mid winter, there is no “fresh” leek seed available in a garden shop. 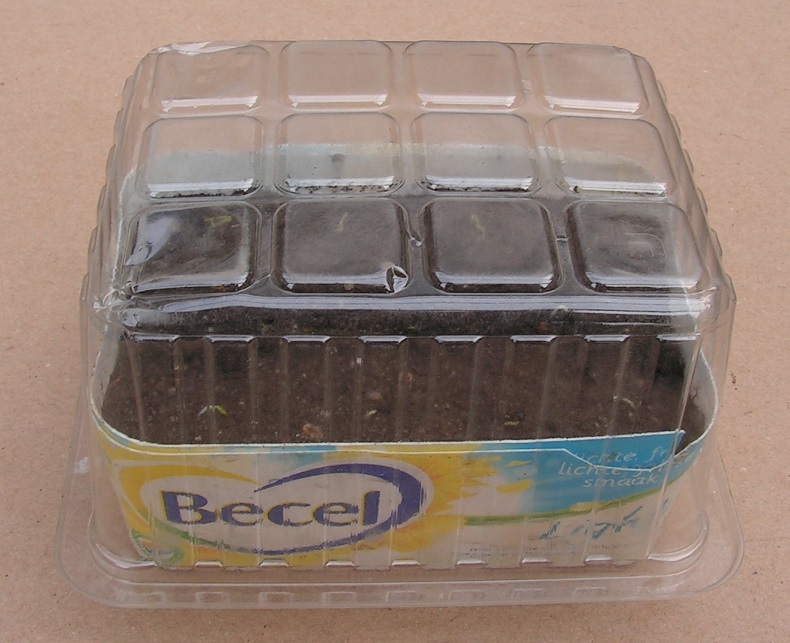 You can buy “fresh” leek seeds in the summer and store the unopened package with seeds indoors in a cool room. Open the package just before sowing. Big chance that they germinate well. When you buy new leek seeds in the winter (in a shop or internet), you don’t know if the seeds were stored correctly in the shop. And if the seeds germinate well. Z)# Sjef’s newest method. Grow leeks indoors in “shove trays” filled with potting soil or compost. Let the leek plants grow bigger indoors. Make a shallow furrow in the garden soil under a greenhouse tunnel. Shove the block of compost or potting soil with small leek plants in the furrow. A)#Jerry’s method. Jerry is a dutch person. Sow leeks indoors in a tray. Take each small leek plant out of the sowing soil and replant it in a small flower pot or in a plastic tray in compost. Let the leeks grow bigger indoors. Make a shallow furrow in the garden soil under a greenhouse tunnel. Put the tray or flower pots with small leeks in the furrow. Jerry wrote in a reaction at tip 36 that he grows leek this way. In tip 36 there is a description of my first experiments using this method. 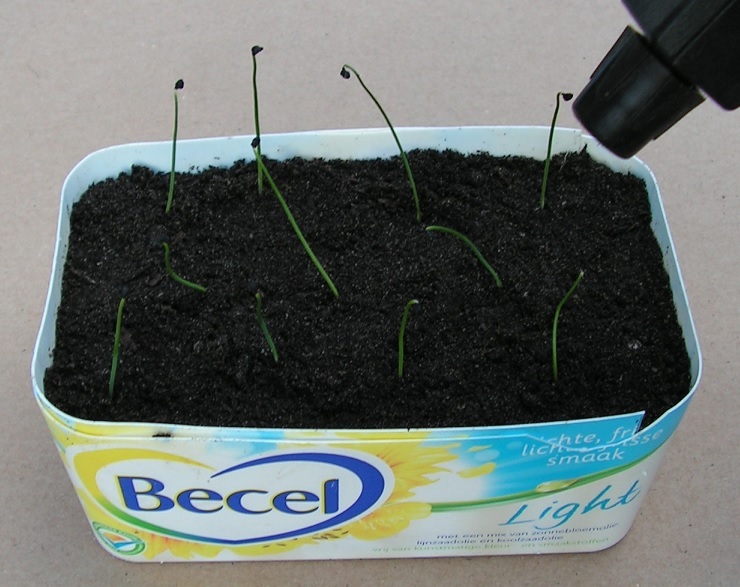 In this tip Jerry’s method is used for growing early leeks. B)# Method on Dutch video. Sow indoors in a big plastic flower pot and do the things as shown in this video . Let the leek plants grow big indoors in the flower pot. C)# Diana’s method. Sow indoors in a tray. Let the leek plants grow bigger indoors. Make a shallow furrow in the garden soil under a greenhouse tunnel. Lift the block of sowing soil with all leek plants in it from the tray and put it in the furrow. The link to the site of Diana about leeks (in Dutch) is here . D)# Sjef’s old method. Sow indoors in small square or rectangular plastic flower pots. Thin out the leeks. Let the plants grow big indoors. Make a shallow furrow in the garden soil under a greenhouse tunnel. Lift each plant with root ball out of the flower pot and plant the leek in the garden soil. 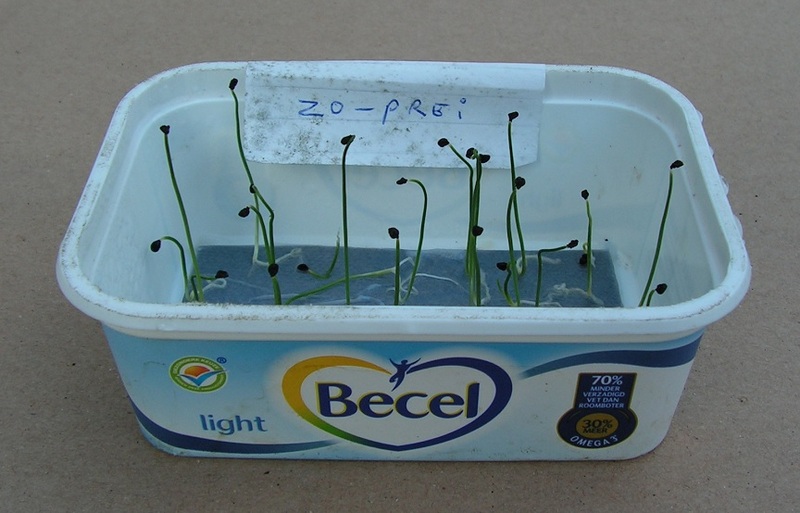 Z)# Grow leek indoors in “shove trays” filled with soil. Sow leek indoors in a tray with compost or potting soil. 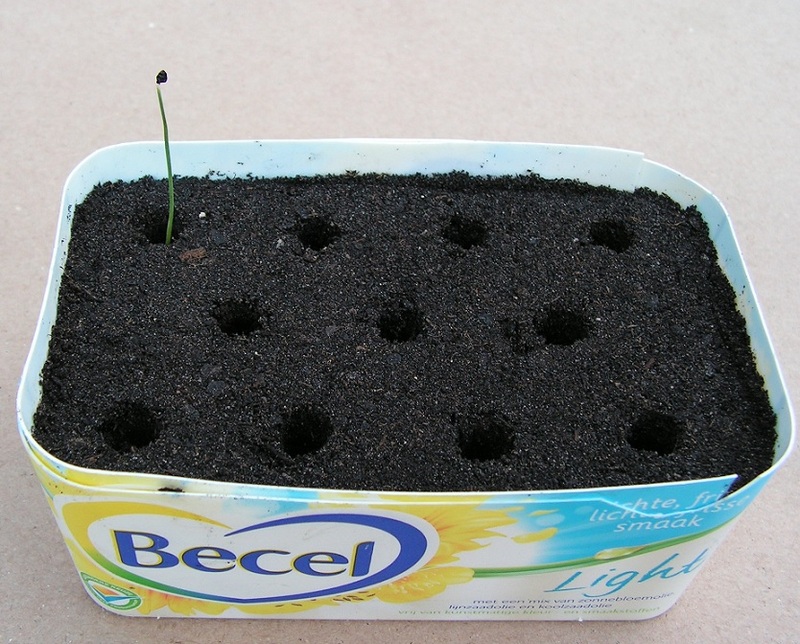 Or sow leek indoors on moist toilet paper and replant the mini leeks in a tray with compost or potting soil. Let the leeks grow bigger indoors. Shove the block of compost or potting soil with leeks from the shove tray in the garden soil. Use a shove tray (left) and an insert (right). Put the shove tray in the insert to form the combi. Fill the combi with sowing soil. Sow leek seeds in the sowing soil. Or …..
…. lay leek seeds on moist toilet paper. 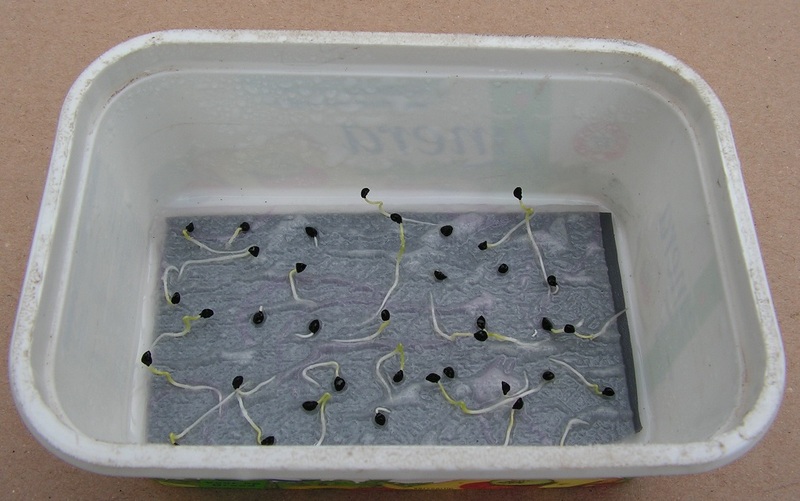 Let germinate and grow indoors. Replant the mini leeks in the soil in the shove trays. Small leek plants in shove trays. Let them grow bigger indoors. Make a small furrow in the garden soil under a tunnel greenhouse. Loosen the garden soil and mix with manure and agricultural lime. Lift the shove tray out of the insert. When you put a putty-knife under the block of planting soil (before shoving), the block gets loose and shoving is much easier. Shove the block of sowing soil with small leek plants on the soil in the furrow. Shove some garden earth against the block of sowing soil. Let the leeks grow bigger in the greenhouse tunnel. Use a “shove tray”and an insert with “closed sides”. More info in tip 2) number 68. The insert makes watering the soil in the shove tray possible. No water can leak out of the combi. The insert has 2 round notches (U-shaped “dimples”) at the upper edge. So you can easily take the shove tray out of the insert. You can shove the block of sowing soil with small plants out of the shove tray. Hold a putty knife against the side of the block and pull the shove tray away. On the photo above the block is on a piece of paper. Z2) Growing leeks, what procedure is easy? 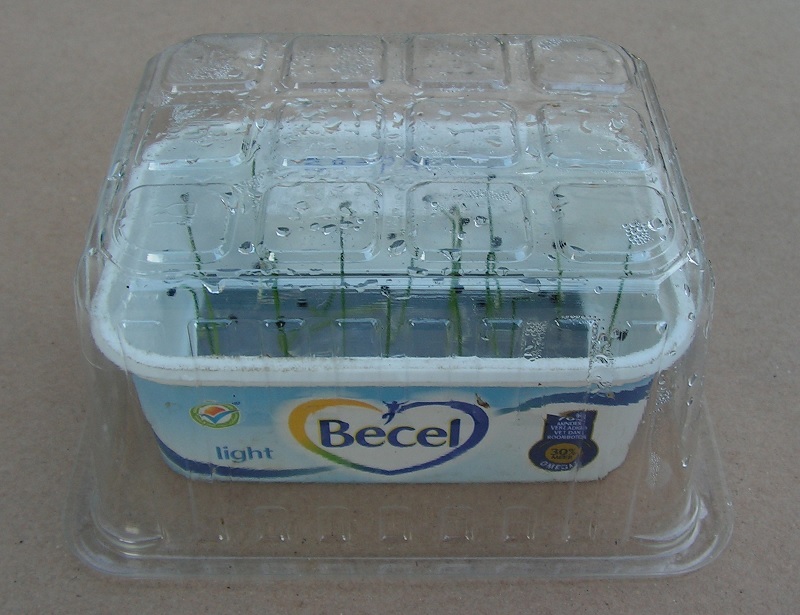 I have found out how to grow mini leek plants in a shove tray easily and fast. 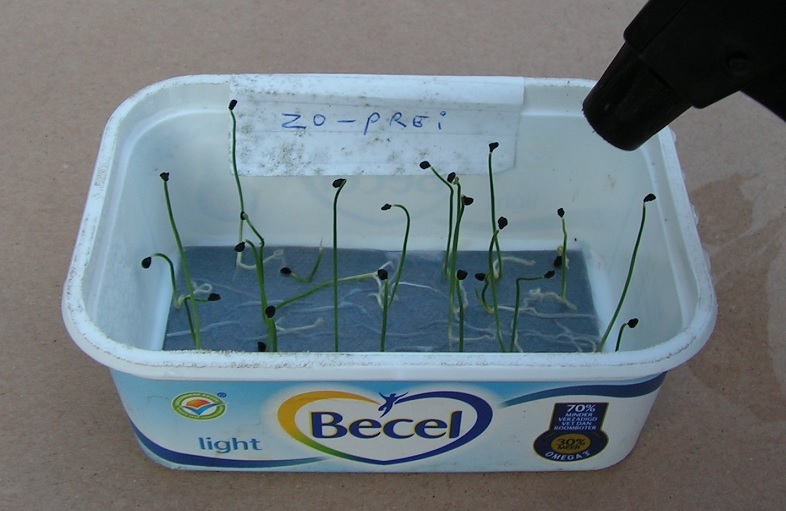 Chapter Z3) Growing leeks in a shove tray shows a step by step description with photos. Below a short description of a very handy and useful procedure. 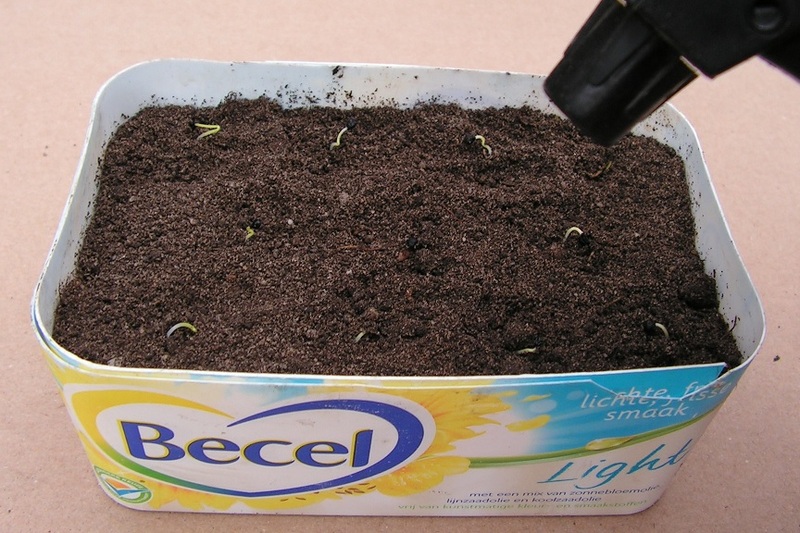 Germinate leek seeds indoors on a warm spot on moist toilet paper. 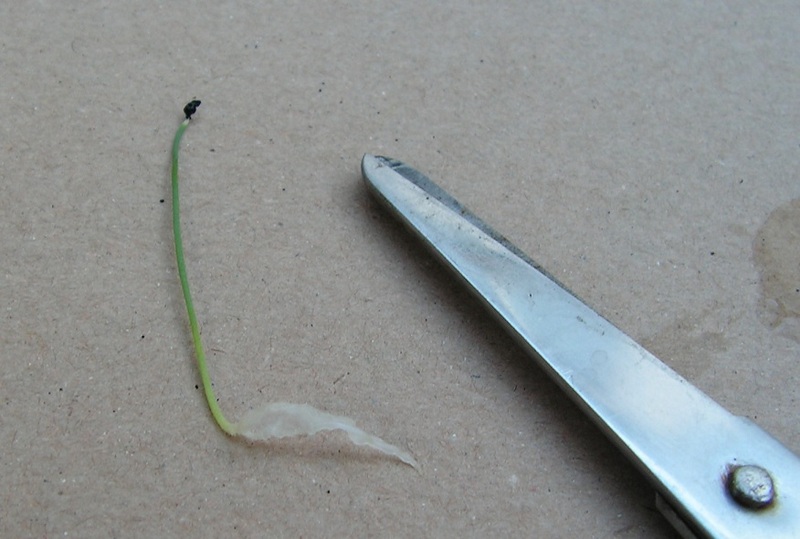 Wait until there are “mini leeks”; germinated leek seeds with a small root and a thin plant stem. Sieve compost or potting soil through the bottom holes of a plastic flower pot. Mix some manure and agricultural lime through the compost or potting soil. 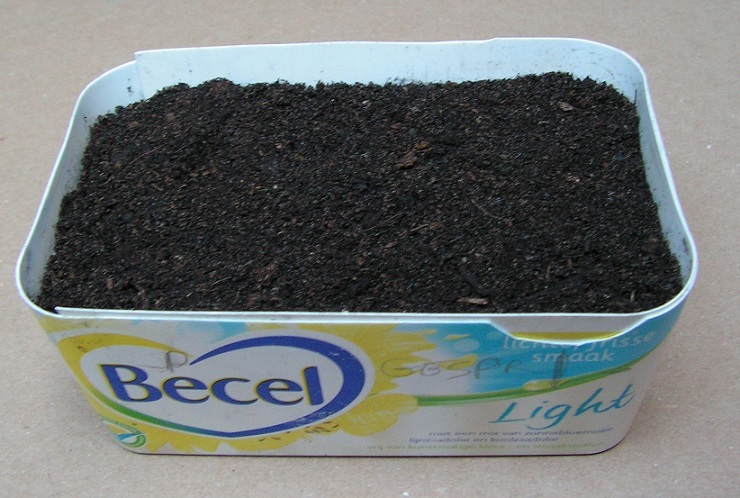 Fill a shove tray combi with this manured compost or potting soil. 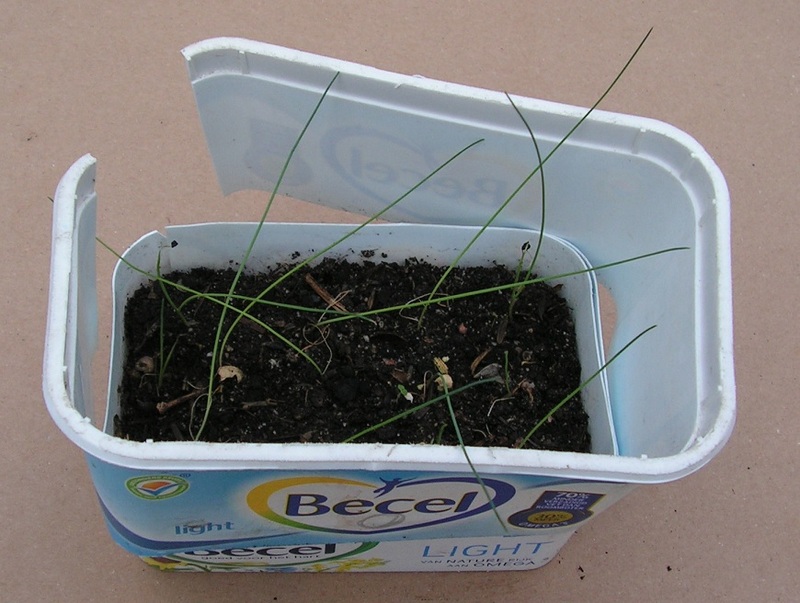 The compost or potting soil is used to plant mini leeks in. In this chapter I call it planting soil. Make planting pits or a planting furrow in the planting soil. Pick one mini leek (using tweezers or between index and thumb) from the moist toilet paper. 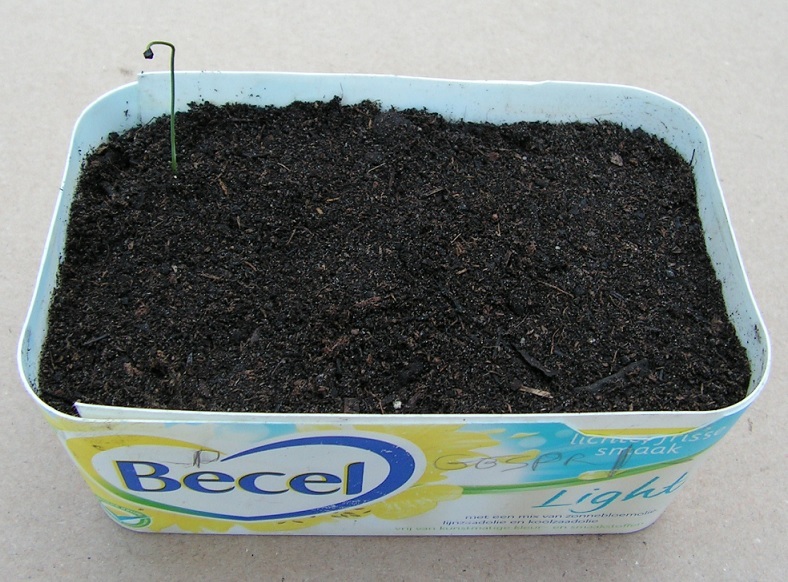 Replant the mini leek in a pit or in the furrow in the planting soil. Replant all mini leeks that fit in the shove tray in the same way. “Drop” the shove tray combi with mini leeks (drop height about 1 inch) on a hard surface. This makes the planting soil more compact, so the mini leeks are firm in the soil and will not topple so easily. The top of the planting soil gets more flat. Spray cold tap water on the planting soil. Put a transparent plastic box over the shove tray combi. Put the whole indoors at a light place at 17 to 23 C (63 to 73 F). Regularly water the leeks and the planting soil in the shove tray combi. Let the leeks in the shove tray combi grow bigger. Remove the transparent plastic box when the biggest leeks (almost) touch this transparent box. Let the leeks in the combi grow bigger indoors. Suppose you sow only 1 leek seed per sowing spot in sowing soil. You don’t know what leek seeds germinate fast, germinate slow or do not germinate at all. This results in sowing soil with big leeks, small leeks and no leeks mixed up. That is undesirable. Or sow 2 or 3 leek seeds per sowing spot in sowing soil. This results in 0, 1, 2 or 3 small leeks per sowing spot. At 2 or 3 leeks per spot you have to thin out carefully. You end up with sowing soil in a tray with big and small leeks mixed up. That is undesirable too. 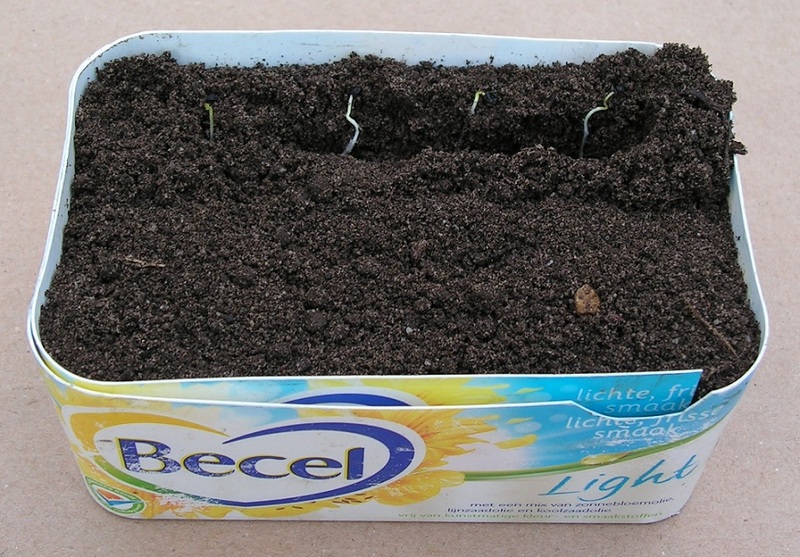 Germinate leek seeds on moist toilet paper. You see what leek seeds germinate fast and what mini leeks grow fast. 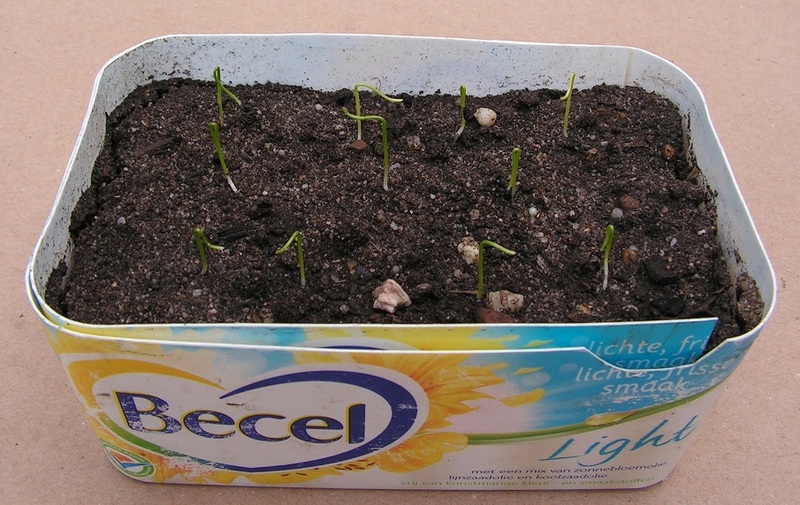 Pick the biggest mini leeks from the moist toilet paper and put them in the planting soil. You end up with leeks in a tray that have (about) the same size. And thinning out is not necessary. “Dropping” the tray on a hard surface makes the top of the soil flat again. And the planting soil gets tight around the roots of the leeks; the mini leeks are firm in the soil. Water the planting soil; this makes the mini leeks grow more firm in the soil. The planting soil (light manured compost or potting soil) feeds the mini leeks. The fibres in compost or potting soil keep the block of planting soil (with mini leeks) intact during shoving in (on) the garden soil. Z3) Growing leeks in a shove tray combi. Below a step by step description with photos. Lay one (cut in half) sheet of toilet paper on the bottom of a 250 grams margarine box. You can also take a whole sheet of toilet paper, fold it in two and put a small gray plastic plate in the folded paper. Germinating process is better visible then. See also tip 2) nr 26 and 73. Use cold tap water to wet the toilet paper. Lay leek seeds on moist toilet paper. Put a well fitting lid on the box. You may press on the lid until “click”; there is a narrow air opening between lid and box. Let the leek seeds germinate indoors and warm (20 to 25 C, 68 to 77 F). When the leek plants (mini leeks) are big enough, you can plant them in the sowing soil. The mini leeks on the photo above are big enough for this replanting. You can also let the leeks grow much bigger on the moist toilet paper. And put “big mini leeks” in the sowing soil. That goes well too. The “big mini leeks” grow faster in the sowing soil. Less “big mini leeks” die in the tray with sowing soil (is my exoerience). 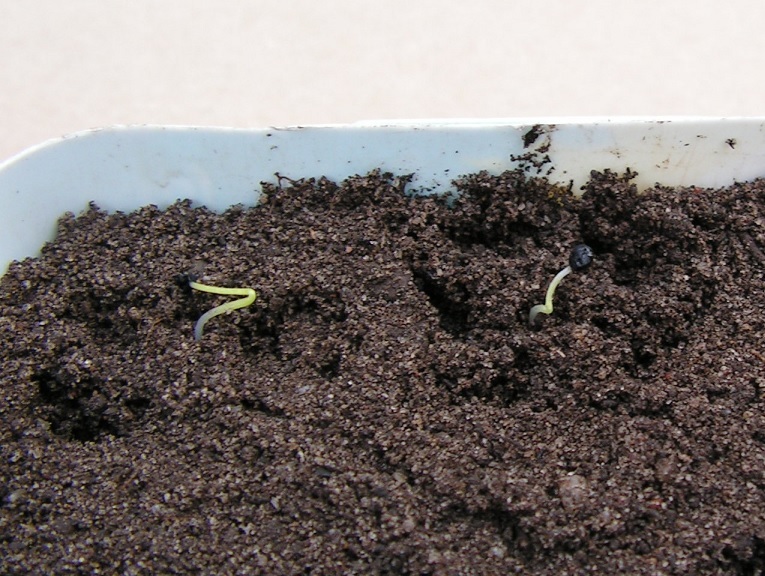 Germinate leek seeds until most seeds have short roots. 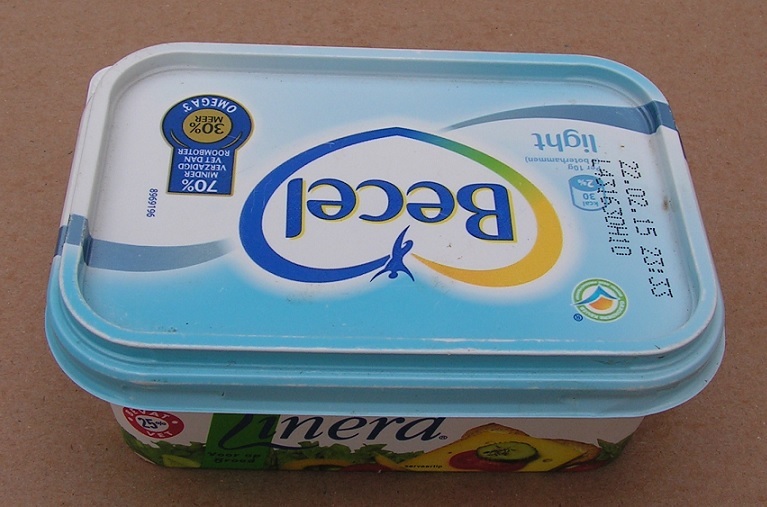 Then put a plastic transparent box over the margarine box. Put the whole before a window at about 17 to 23 C (63 to 73 F). Mind that the toilet paper is moist; add or spray water when needed. Let the mini leeks grow bigger on the moist toilet paper. Big and small mini leeks on moist toilet paper, big enough to plant out. Fill a shove tray combi with sieved planting soil. The soil has been sieved through the bottom holes of a plastic flower pot. Use potting soil or compost as planting soil. Mix some manure and agricultural lime with the compost or potting soil. Manure feeds the mini leeks. Agricultural lime reduces acidity of the planting soil. Sieved potting soil, mixed with manure and agricultural lime. Sieved compost, mixed with manure and agricultural lime. Making pits or furrows when planting mini leeks. Before planting the mini leeks you can make pits or furrows in the planting soil. And you can plant small or big mini leeks. Below a description with many photos. Small mini leeks can be planted in a furrow or in pits. Use the point of a pencil to make a planting furrow. Depth is about 1.5 centimeters (5/8 inch). You can put a piece of place mat with sowing holes on the soil. More info about these mats in tip 2) number 70. 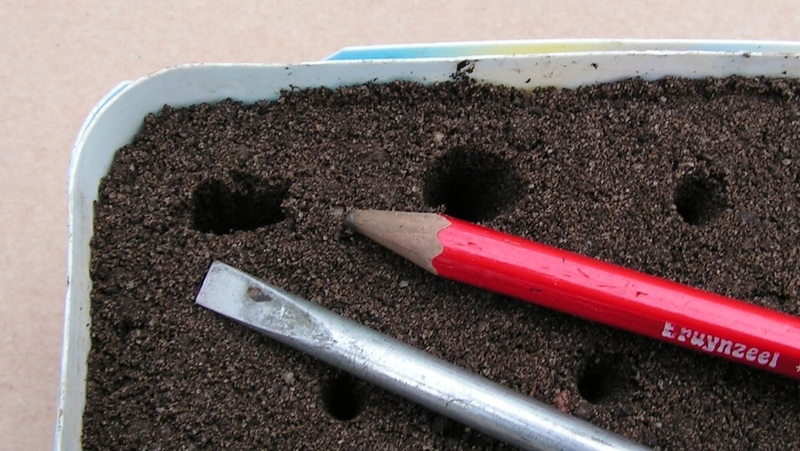 Use the point of a pencil to make planting pits in the soil. Distance between the pits is about 3 centimeters (1.2 inch). Or make planting pits (without a place mat) in the soil with the same distance (about 3 centimeters (1.2 inch)). Planting soil with 11 planting pits. Pits were made using the point of a pencil. Use a pencil or screw driver (or something like that) to make each planting pit wider and deeper. Required width is about 1 centimeter (0.4 inch), depth is about 2 centimeters (0.8 inch). When planting pits are some deeper, there’s no problem. Spray water on toilet paper. That eases the picking of the mini leeks from the toilet paper. Use tweezers to pick 1 mini leek. Photos above; small mini leeks, big enough to plant in the soil. The white part of the mini leek is the root and must be planted in the soil completely. The light green part is the stem and has to stay above the soil. The little black ball is the seed coat. This little ball grows upward together with the little stem. After a while the little ball falls of. Put a mini leek in a planting pit. Or “hang” a mini leek against the side of a planting pit. Tweezers: hold the mini leek in the planting pit. Tea spoon: meanwhile push sowing soil against the root of the mini leek. Tea spoon; shove more sowing soil in the planting pit to fill the pit. Or put the mini leeks in furrows. 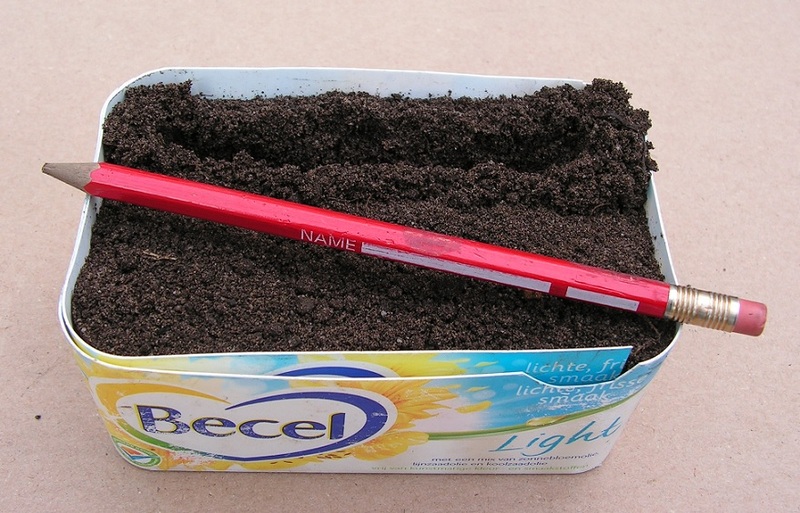 Use a tea spoon to make a “big” planting pit in the soil. This pit is big enough to fit the long (curled) root of a big mini leek. Pick one big mini leek between index and thumb and lift it from the moist toilet paper. Photo of a big mini leek with a long curled root. Put a big mini leek with a long (curled) root in a planting pit. Turn or roll the root to fit it in the planting pit. Shove planting soil on the root and around the stem. 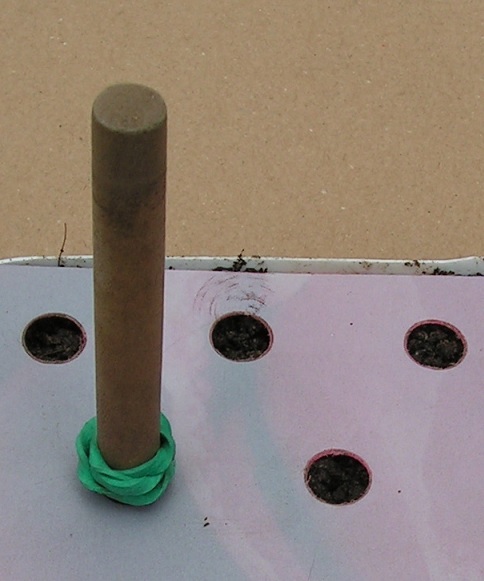 You can use a “sowing stick” and a piece of place mat with holes to make round planting pits in the soil. Or make round planting pits (without a place mat) in the soil with the same distance (about 3 centimeters (1.2 inch)). Use sharp scissors to shorten the (white) root of the mini leek. Shorten the root so it fits in a round planting pit. Put the mini leek (with shortened root) in a planting pit. Shove planting soil on the root in the planting pit. Continue planting mini leeks until there are enough mini leek plants in the pits or furrows. Let the residual small mini leeks grow bigger on the moist toilet paper until they are big enough to plant out. “Drop” the shove tray combi with mini leeks (drop height about 1 inch) on a hard surface. This makes the planting soil more compact, so the mini leeks are firm in the soil and will not topple so easily. The top of the soil gets more flat. Look at the difference between 2 photos above. Spray cold water on top of the planting soil. Put a plastic transparent box over the trays. Put the whole indoors at a light place (before a window) at 17 to 23 C (62 to 73 F). Remove the transparent box after a few days. Or remove the transparent box when first leek plants (almost) touch the transparent box. 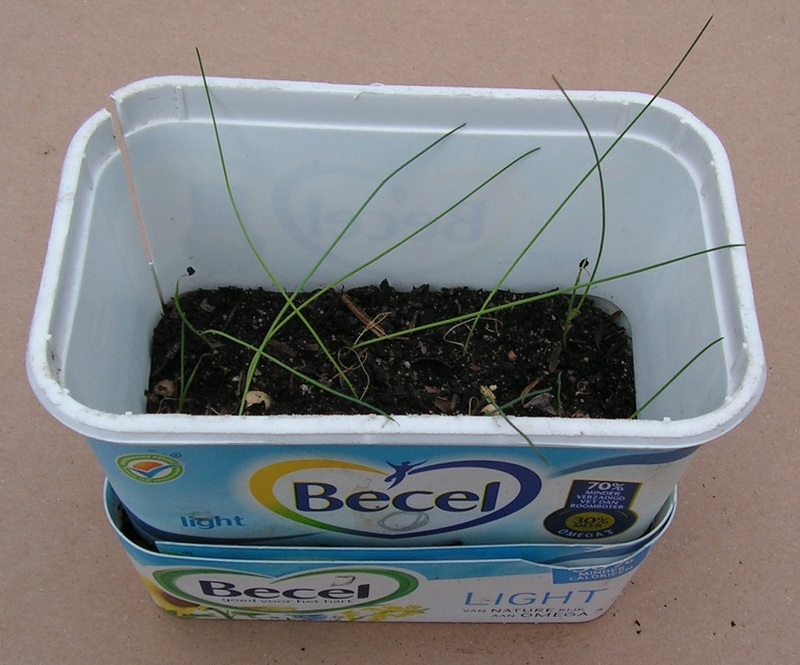 This photo shows small mini leeks, 4 days after planting. Let the leeks grow bigger indoors at a light place. After replanting many mini leeks, there are some “slow” leek seeds on the moist toilet paper. These seeds germinate very late (or never). Advice: do not use these slow seeds. When desired, you can put new fresh leek seeds on new moist toilet paper. When using each procedure, mentioned above, you can grow many good leek plants in a shove tray combi. When planting small mini leeks, sometimes 1 or 2 leeks die afterwards in a shove tray. When planting big mini leeks, most plants stay alive. There is no difference between a long root or a shortened root at a big leek plant; all leeks grow well. 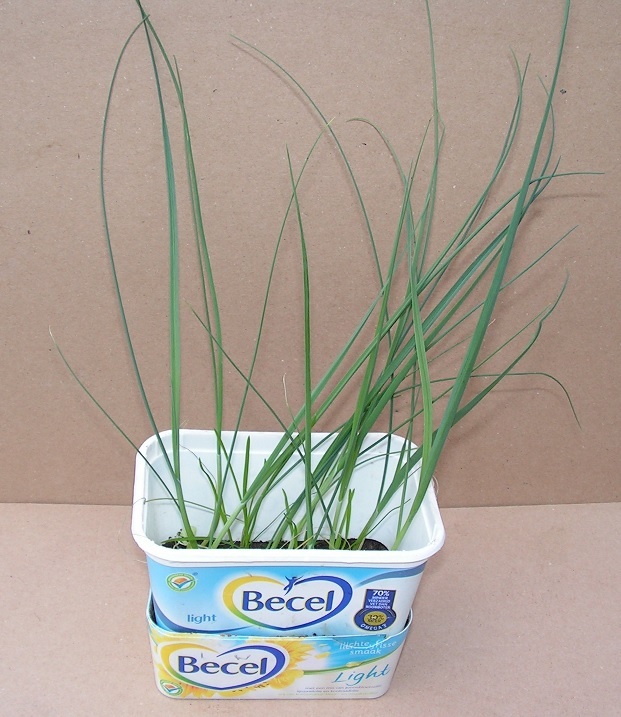 Mini leeks grow well in potting soil or in compost. there are green algae on the planting soil. Long mini leeks easily topple or grow crooked in the shove tray combi. 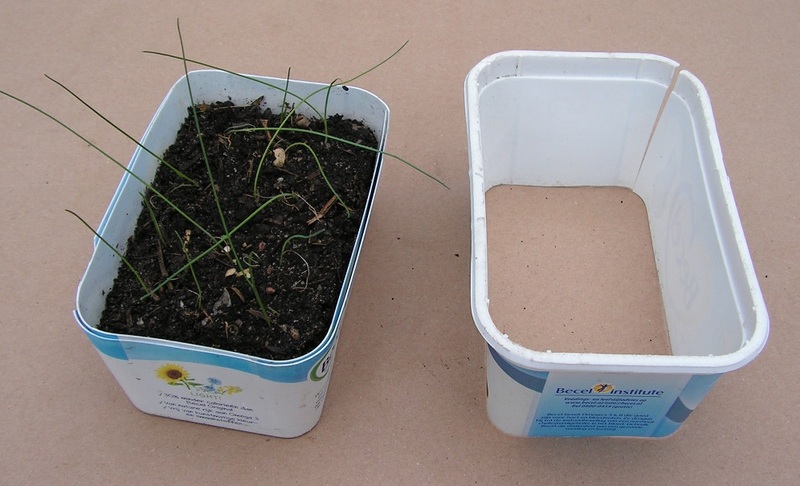 You can carefully put a bottomless margarine box on the planting soil in the shove tray combi. Leeks can not topple anymore. Make sure that you don’t push over or pinch off leeks during putting on the bottomless box. Attention: the leeks on the 2 photos above are different from the other leeks in this chapter. 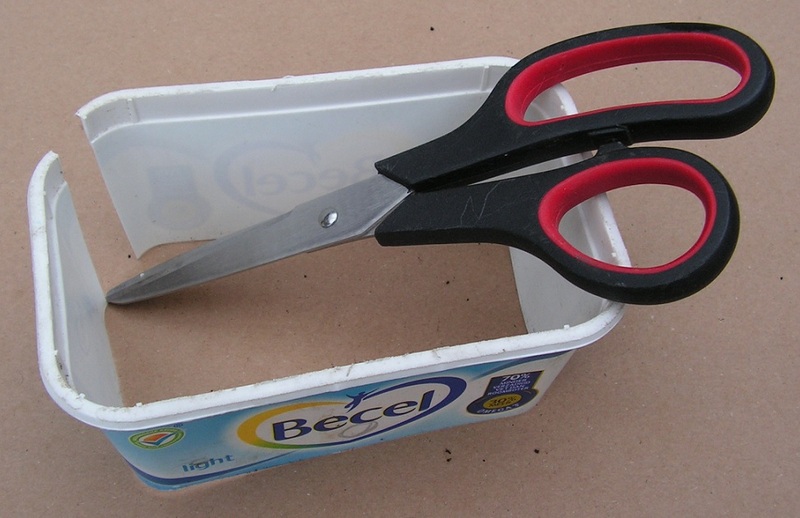 When you cut one corner of a bottomless margarine box, putting on this box is much easier. See photos below. One cut bottomless margarine box next to a shove tray combi with leek plants. Put the cut bottomless box on a flat surface. Lift the shove tray combi with leek plants and put it “in” the cut bottomless box. Lift the cut bottomless box along the shove tray combi. The sides of the cut bottomless box “get open” because the top side of each margarine box is wider than the bottom side. Put the cut bottomless box on the planting soil in the shove tray combi. Push the bottomless box a few millimeters (1/4 inch) in the planting soil. You can close the slit of the bottomless box. Make sure that you don’t pinch off leeks during this step. On March 21 (beginning of spring) my home grown leeks have this size. They are some thinner than leek plants from a gardening shop. From the end of February (late winter) on, you can shove blocks of sowing soil with small leek plants on the garden soil under in a greenhouse or under a greenhouse tunnel. Use a fork or a garden shovel or a spade to loosen the soil. Put a greenhouse or a tunnel of transparent corrugated plate over the loosened garden soil. Remove or open the greenhouse (tunnel). Scoop some earth from the garden to form a furrow of about 10 centimeters (4 inch) deep. Drop the earth next to the furrow on the garden soil. Scoop more garden earth to make the furrow about 5 to 10 centimeters (2 to 4 inch) deeper. Drop the garden earth in a bucket. Add dry crumbled (cow) manure and agricultural lime to the garden earth in the bucket. Ratio of the ingredients; garden earth : manure : lime is about 30 : 2 : 1. Mix the garden earth, manure and lime in the bucket thoroughly. Put the mixture from the bucket into the furrow. Use a small wooden board to spread the mixture in the furrow. Pour some cold tap water on the sowing soil (with leek plants) in the shove tray combi. Wait for at least 10 minutes to have the water drop in the sowing soil. 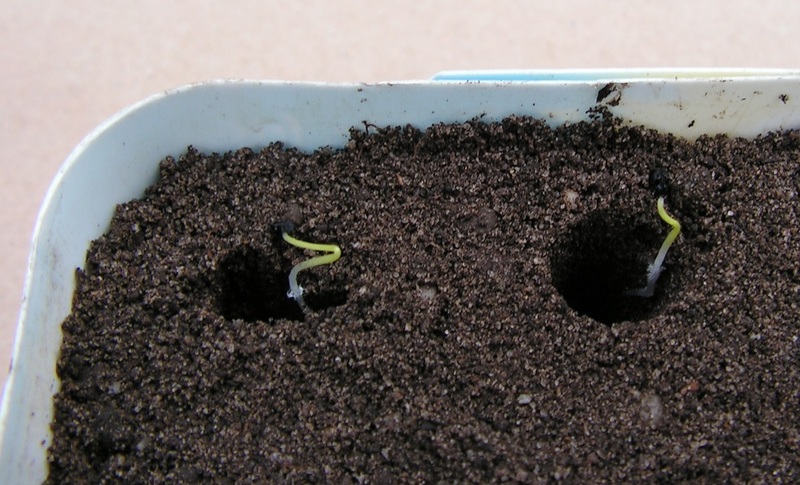 A block of “moist” sowing soil can more easily be shoved out of the shove tray. And a block of moist sowing soil does not fall apart so easily during or after shoving. Put the combi on the garden soil in the furrow. Take the shove tray with leek plants out of the insert. Put the shove tray with leeks at the desired place in the furrow. Place a putty knife vertically in the shove tray near the short closed sidewall. Use one hand to pull the shove tray to the left, while holding or pushing the block of sowing soil with the putty knife aside to the right. After shoving, hold the putty knife vertically against the block of sowing soil. Meanwhile use your hand or a garden shovel to shove some garden soil against the other (left) side of the putty knife. Then carefully pull the putty knife vertically out of the soil. The extra garden soil prevents the block from falling apart and from leeks toppling. Use this method to shove all blocks of sowing soil with leeks in the furrow. Use the putty knife to shove garden earth against the long sides of the blocks. When needed, strew some crumbled moist garden earth in open spaces between the blocks. Before shoving the blocks have been watered in the shove tray. So no need for watering the leeks right after shoving. Close the greenhouse (tunnel) above the leek plants. Water the leeks frequently. Use a watering can with a sprinkler head with small holes. Let the leeks grow big in the greenhouse or under the greenhouse tunnel. Open or remove the greenhouse (tunnel) when the big leek plants touch the roof. See the photo above; the leeks at the right side (shoved on March 11) touch the roof of the greenhouse tunnel at May 1. When leeks are as thick as a pencil (or thicker), plants can be replanted seperately in the garden soil. See tip 36 for info about planting leeks. Below a description and photos of early leek growth using Jerry’s method. 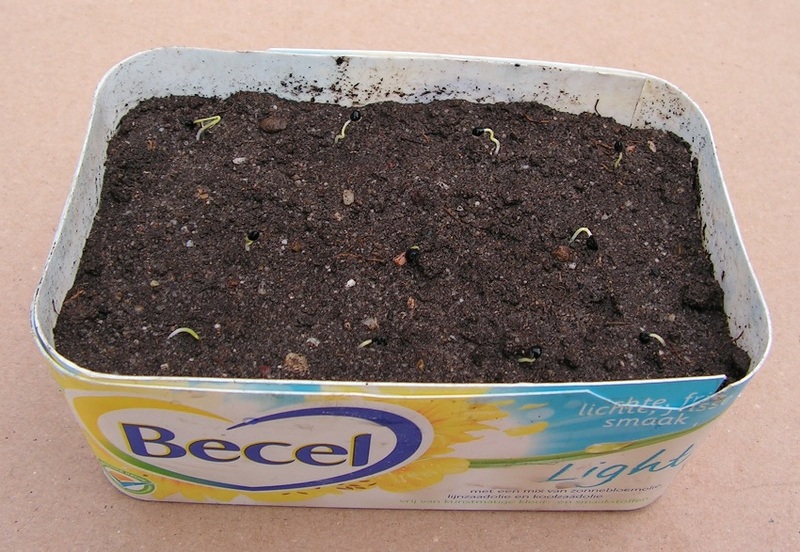 Sow leek in a tray (margarine box) filled with sowing soil. Let the leeks grow bigger indoors. 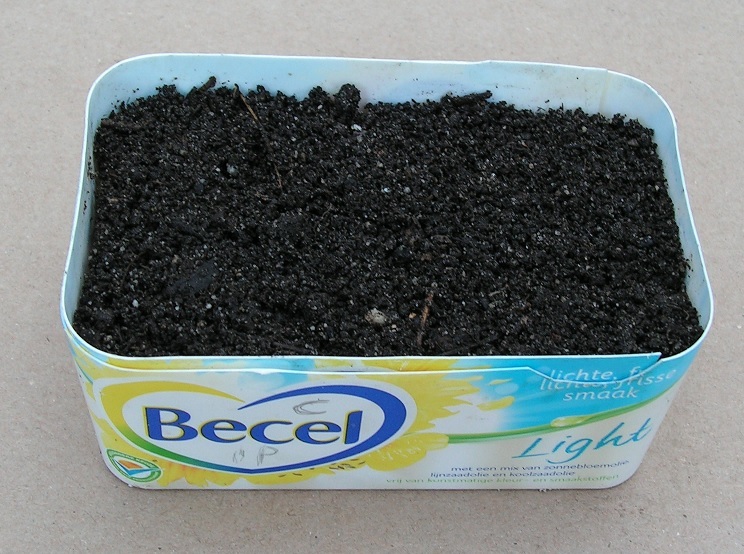 Leek seeds were sown in 2 (lowered) plastic margarine boxes filled with sowing soil. Leek plants have grown for 8 weeks at about 20 C (68 F). The plants are big enough for replanting. The leek plants in the left side box have been thinned out. The leeks in the right side box have not been thinned. 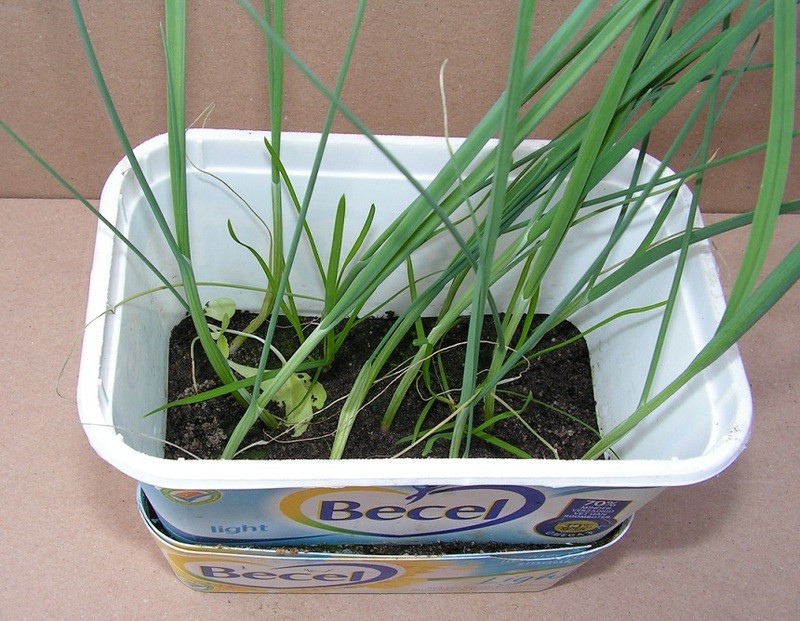 Submerge the box with sowing soil and leek plants in cold water. Or pour much water in the box with sowing soil. 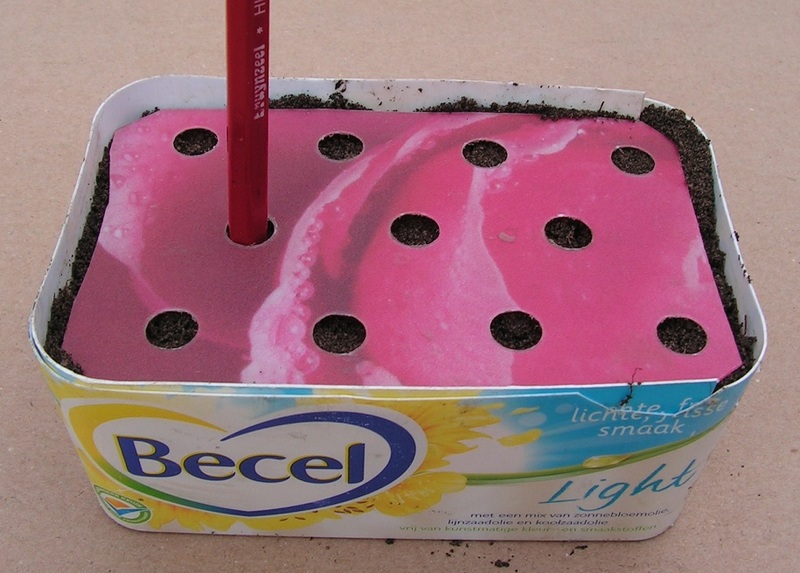 Squeeze the sides of the box to loosen the plants in the muddy sowing soil. Carefully pull the leek plants out of the muddy sowing soil. 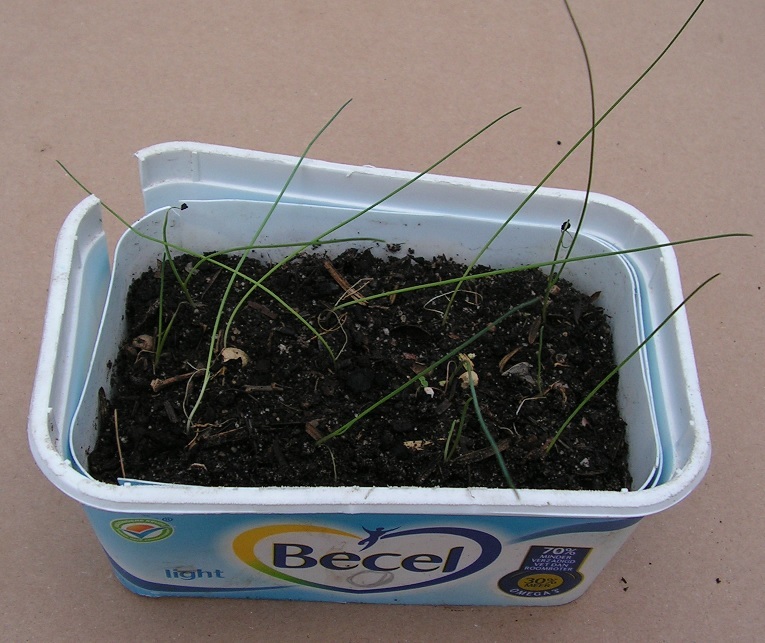 These small leek plants have been thinned out when growing in the tray. After thinning, the leek plants grew seperately in the sowing soil for some weeks. The ruler next to the plants indicates centimeters (1 inch = 2.54 centimeters). These leeks grew seperately or in groups of 2 or 3 plants in the sowing soil. These leek plants have not been thinned out. The ruler next to the plants indicates centimeters (1 inch = 2.54 centimeters). There is no (big) difference between the thinned leeks and the not thinned leeks. The leeks in both groups have approximately the same size. 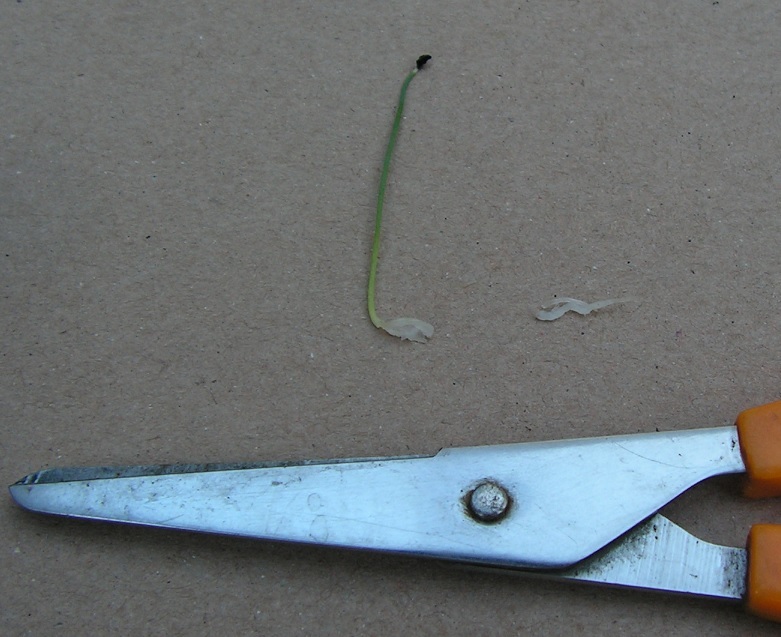 When desired use scissors to shorten the roots of the small leek plants to about 2.5 centmeters (1 inch). Mix sieved compost, fine grained dry manure and agricultural lime in a tray (ratio 20:1:1). Put an insert in a small flower pot. Put some mixture (compost, manure, lime) in the flower pot with insert. Lay the roots of a small leek plant on the mixture in the flower pot. Hold the leek plant straight. Put some more mixture in the flower pot. Press on the mixture in the flower pot, next to the leek plant. Mind that the “heart” of the leek is well above the mixture in the flower pot. The “heart” of the leek is where the leaves split. Is the leek plant too deep in the mixture (the heart is below soil level), the plant can die. You can put this “support” next to each leek plant. The leeks grow straight up than and not crooked. 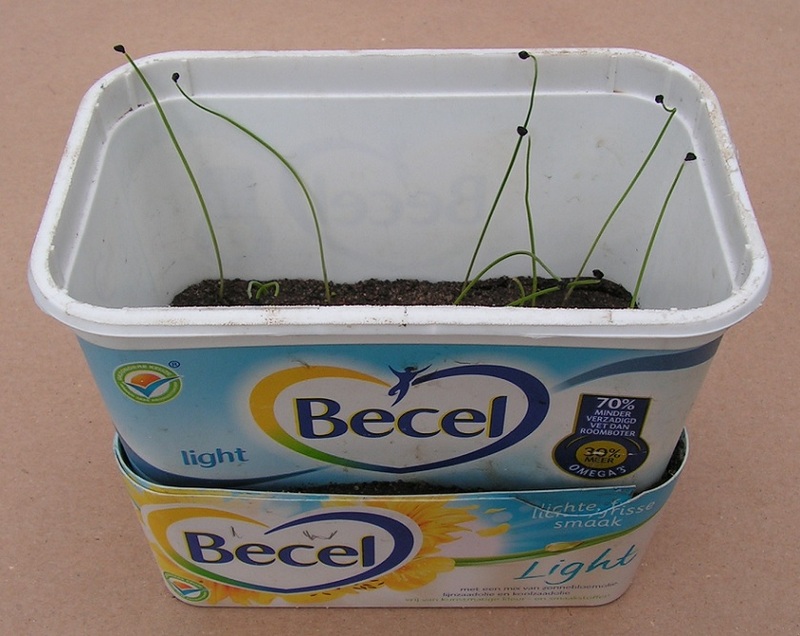 You can plant small leek plants in a plastic tray with round holes, in the same mixture. And put a support next to each plant. Put the flower pots or the tray with leek plants indoors before a window. Temperature between 15 and 20 C (59 to 68 F). Leeks can grow bigger for some weeks. 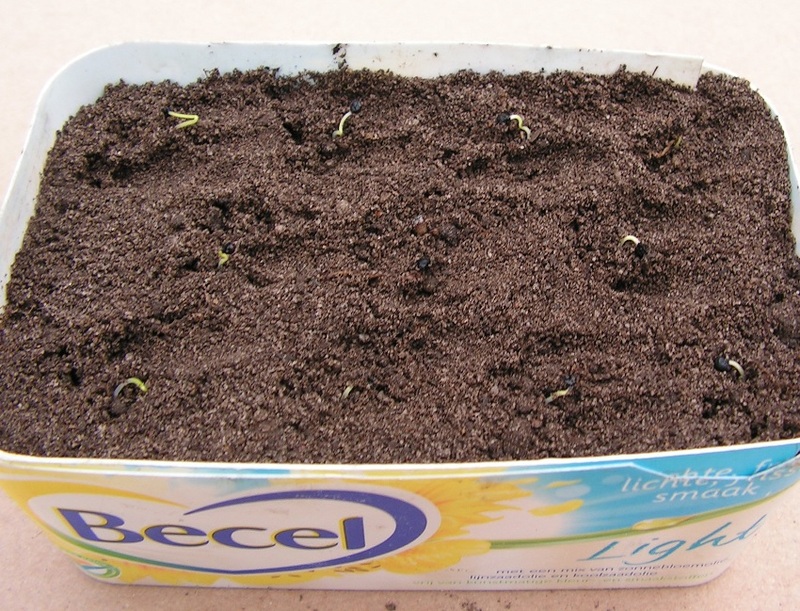 A3) Putting flower pots or a tray with leek plants on the garden soil under a greenhouse tunnel. From the end of January or beginning of March (end of winter) on, you can put the flower pots or the tray with leek plants in (on) the garden soil. In a greenhouse or under a greenhouse tunnel. 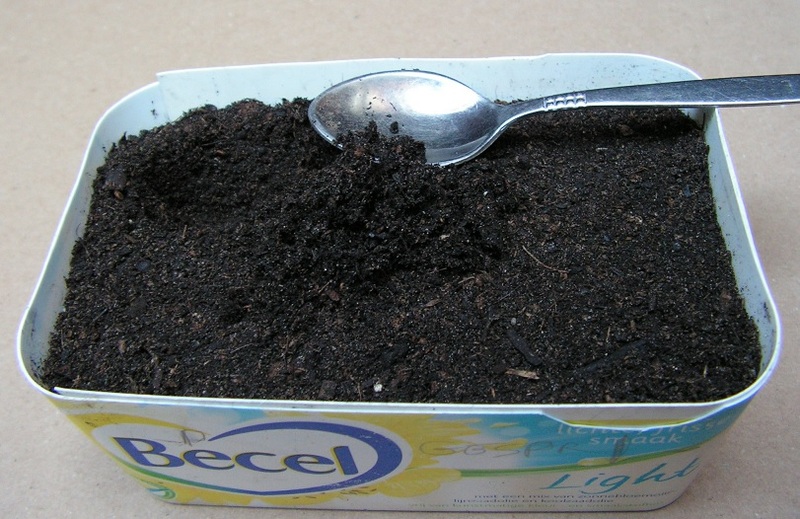 The same actions as described (above) at Preparing the garden soil in Z4). After a few weeks of growing indoors before a window, the leeks are big enough to plant in the garden soil. The pots have been put in the garden soil under a greenhouse tunnel. The pots with leek plants are at the left side of the photo above. Photo date is April 13 2015. Click for wide screen. These trays with leek plants has been put in the soil at March 11, 2016. Click for wide screen. Leeks at May 1, 2016. Only the far left tray with leek plants is still under the tunnel. The other leek plants in the trays have been planted in the garden already. When the stem of a leek plant is as thick as a pencil (or thicker), the leek can be planted individually in the garden soil. These leeks with big root balls have been taken out of the tray and planted in deep round holes in the garden soil at April 13. More info about planting leeks in the soil in tip 36. Date of this photo is May 1. This method is not so handy for early leek plants. In January, February and March (end of winter) you have a big heavy flower pot indoors before a window. In tip 36 you can read that the leeks do not grow fast in the soil mixture as advised in the video. Leeks will grow faster when you use a richer soil mixture in the flower pot. Fill a tray with sowing soil. 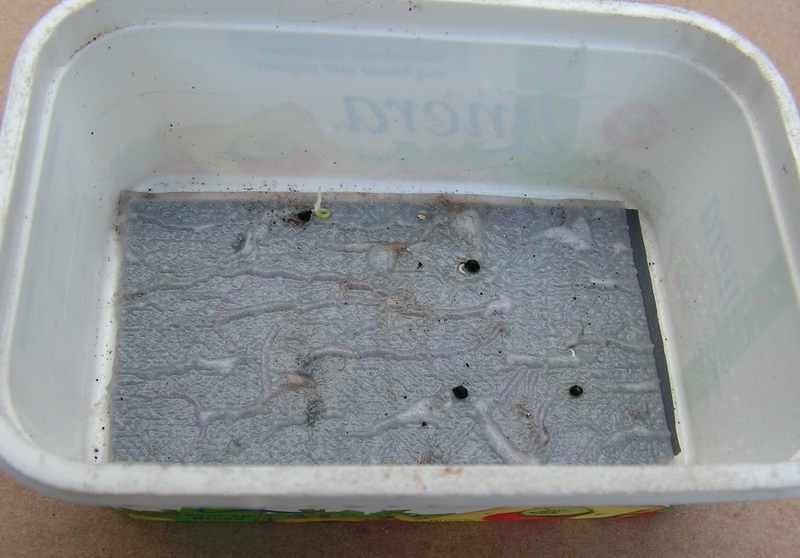 You can put a piece of rubber sink mat on the sowing soil. Handy to sow leek at fixed distances. 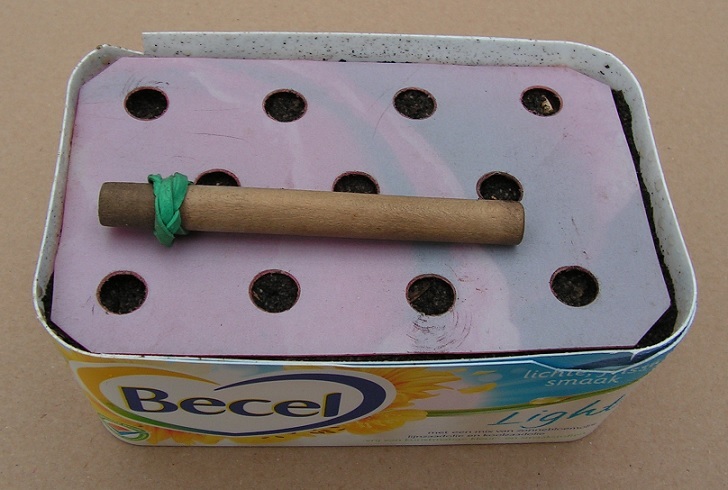 Use a “sowing stick” to make sowing holes in the soil. 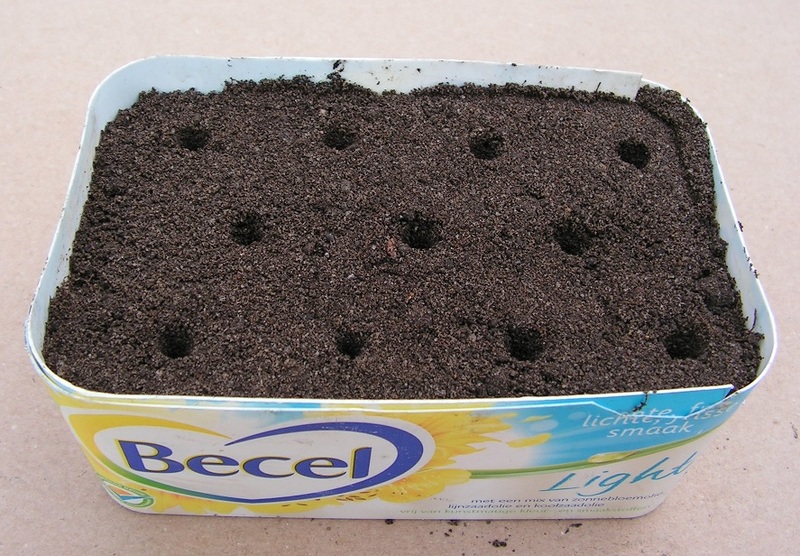 Drop 2 or 3 leek seeds in each sowing hole. 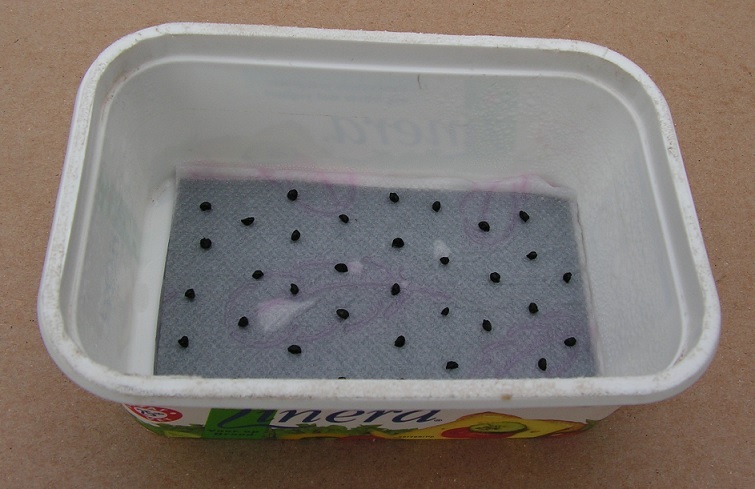 Use tweezers or a shift fall tray to drop the seeds in the sowing holes. Strew a thin layer of dry sand or sowing soil on the seeds. Let the seeds germinate and let the leek plants grow bigger indoors at a temperature of about 15 to 20 C (59 to 68 F). Use scissors to cut leek plants right above the soil. Or pull the leek plants out of the soil. On the photo above: before thinnning (left photo) and after thinning (right photo). From the end of January or beginning of March (end of winter) on, you can put the block of sowing soil with leek plants in (on) the garden soil. Put the block on the soil in a greenhouse or under a greenhouse tunnel. At Diana’s procedure you lift the whole block of sowing soil with leek plants out of the tray. And you put (lay) this block on the bottom of a furrow in the garden soil. Lifting the block of sowing soil is the hardest step. And it can go very wrong. In chapter C3a), C3b), C3c) and C3d) there are 4 circumstances described when lifting the block of soil. You have a big tray with sowing soil. Thin leeks grow far apart. Here you see 2 big trays with sowing soil. The leeks in the soil grow about 4 centimeters (1.6 inch) apart. Leeks are rather thin. Put the tray with sowing soil and leeks next to the furrow. Lay a heavy brick or stone on 2 edges of the tray (at 2 opposite sides). The bricks keep the tray on the soil during lifting. Use both hands to grab “as many leek plants as possible” at the stems. Very carefully lift the block of sowing soil with leeks out of the tray. Very slow and without abrupt movements put he block on the soil in the furrow. During this transport or after putting in the furrow, the block of soil can fall apart. When that happens, shove the pieces of sowing soil against each other again. Shove garden earth against the sides of the blocks of sowing soil with leeks. Spray water on the leeks and on the soil. The lifting and depositing of the block of sowing soil went wrong. The block fell apart. The parts of the block have been shoved against each other in the furrow. That’s why the leek plants in the soil are disorderly on the photo above. Later on these leek plants have grown into good pencil thick leek plants. 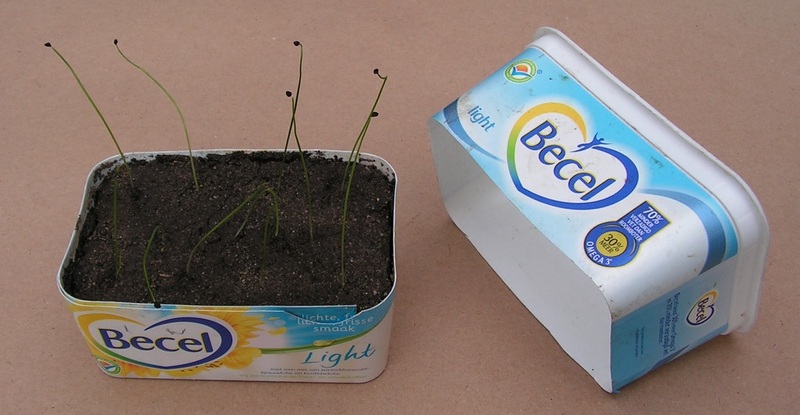 Here the leek plants grow in a lowered plastic 500 grams margarine box. The leeks grow about 2.5 centimeter (1 inch) apart. Hold the tray with leek plants in one hand. Press with your other hand (outside) against the bottom to loosen the block of sowing soil from the bottom. Push the leek plants a little together. Fold one hand around all leeks to “grab” all plants. Carefully pull the leek plants up to lift the block of sowing soil. In the mean time hold the tray with your other hand. Quietly lift the block of sowing soil with leeks out of the tray. Put the block of soil with leeks on the garden soil in the furrow. These photos show the lifting and deposition of a block with leeks when using a 250 grams margarine box. After lifting and before deposition, the blocks of sowing soil with leeks have been put aside on the garden soil. There are many roots at the bottom side of the block of sowing soil. Due to these roots. the block of sowing soil does not fall apart so easily and lifting and deposition goes well. When the leek plants are thicker and when the leeks grow closer together, lifting out of a large tray goes better. The block of sowing soil will not fall apart so easily during lifting or depositing. When you have a large tray with thin leeks, you better let them grow bigger first. 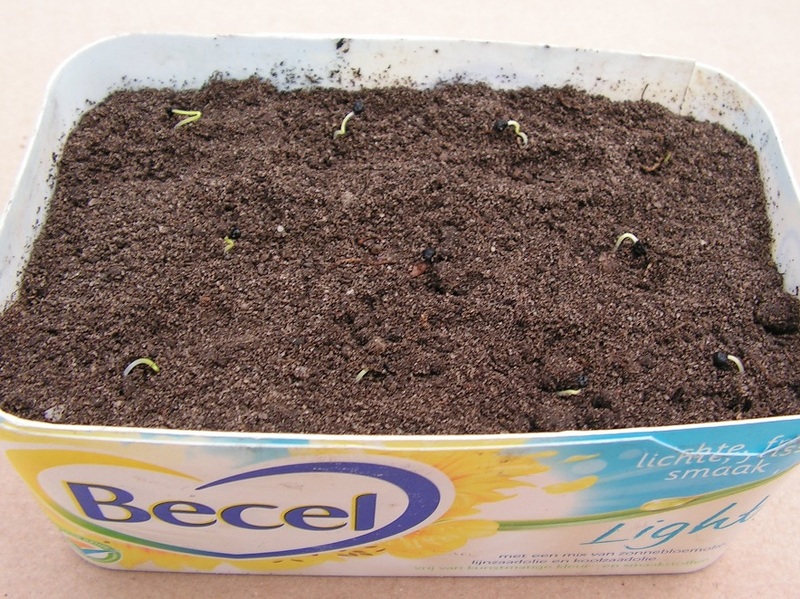 Put the tray with sowing soil and leeks on the garden soil under (in) a greenhouse. Put the large tray with sowing soil and leeks in a furrow in the garden soil under (in) a greenhouse. Let the leek plants in the tray grow bigger. Let the leeks in the tray grow bigger until their stem thickness is about 3 millimeters (1/8 inch) or thicker. Lifting the block of sowing soil with thick leeks is much easier to do. Put the tray with leeks in the furrow to check if the furrow is wide and deep enough. Take the tray out of the furrow. Put the tray next to the furrow. Grab many leek plants with one hand. Use the other hand to hold the tray on the soil. Carefully lift the block of sowing soil with leeks out of the tray. After lifting you see that there are many roots at the bottom side of the block. So the block will not fall aparts so easily during handling. Put the block of soil with leeks in the furrow. Shove garden earth against the sides of the block of sowing soil with leeks. When you sow leek in December or January (mid winter), the leek plants are not very big at the beginning of march (end of winter). The leeks have few roots and their stems are thin. Lifting the block of sowing soil with leeks will not be easy then. When you do want to lift and deposit a big block of sowing soil with thin leeks, you can use a “bottom plate” and a “bed of nails”. A “bed of nails” (a wooden board with wire nails hammered in). The points have been made blunt by file. A thin plate of cardboard in a plastic bag (same size as the bottom of the tray). The plastic bag keeps the cardboard plate dry. The wire nails fit in the holes in the bottom. The plastic bag with cardboard plate can lie on the wire nails. The plastic bag is longer than the size of the tray. It has a “loose end”. Lay the plastic bag with cardboard plate on the bottom of the tray. Put the “loose end of the plastic bag” against one side of the tray. This loose end may extend above the edge of the tray. Fill the tray with sowing soil. The soil is on the plastic bag with cardboard plate in it. Right before planting, put the tray with potting soil (and leeks) on the wire nails of the bed. The photos above show a tray with sowing soil without leek plants. Slowly push at 2 opposite edges of the tray. Push the tray downward. The plastic bag with cardboard plate and the block of sowing soil is resting on the points of the wire nails. The plastic bag with cardboard plate and sowing soil can be lifted from the points of the wire nails. And carefully laid in a furrow in the garden soil. These photos show how the plastic bag with cardboard plate and a block of soil with leeks is on the points of the wire nails. The short sides of the tray have been lowered to ease the lifting (picking up) of the plastic bag etcetera from the wire nails. Put the “bed of nails” next to the furrow. Place (put) the tray with sowing soil etcetera on the points of the wire nails. The loose end of the plastic bag towards left. The plastic bag with cardboard plate and sowing soil etcetera is now on the points of the wire nails. Put the fingers of both hands under the plastic bag with cardboard plate and sowing soil etcetera. Carefully lift the whole from the points of the wire nails. Lay (deposit, put) the whole on the soil in the furrow. The loose end of the plastic bag towards left. Fold the loose end of the plastic bag towards the bottom of the furrow. Hold a small wooden board against the left side of the block with leek plants. Carefully pull the loose end of the plastic bag to the left. In the mean time hold or push the block of sowing soil with the wooden board aside to the right. The block of sowing soil with small leek plants is now on the bottom of the furrow in the garden soil. Leek plants in flower pots or in a tray in the garden soil grow slower than leek plants that grow “free” in the soil. Compost in flower pots or in a tray dries out faster than a block of compost in the garden soil. Under a tunnel, one day after watering, the compost in the pots or the tray is dry, while the garden soil is still moist. In flower pots or in a tray the roots of the leek plants can’t go far down to search for water. The bottom of the pots or of the tray limits the vertical growth of the roots. At the flower pots (or at the tray) no water can get in from the surrounding moist garden earth. In the free soil, water can also flow aside. In pots or tray the leeks can have some growth stops. In the free soil the leeks grow on. From March (early spring) on you can buy small leek plants in a garden shop, 4 plants cost about €1.00. But you can grow leek plants that have in March the same size as the ones from the shop. On this photo you see 20 “home grown” leek plants in small black pots. Right rear on the photo there is a square tray with 4 leek plants that I bought. Follow the steps as described below. Find out how many pots are to be filled so how much mixture is needed. 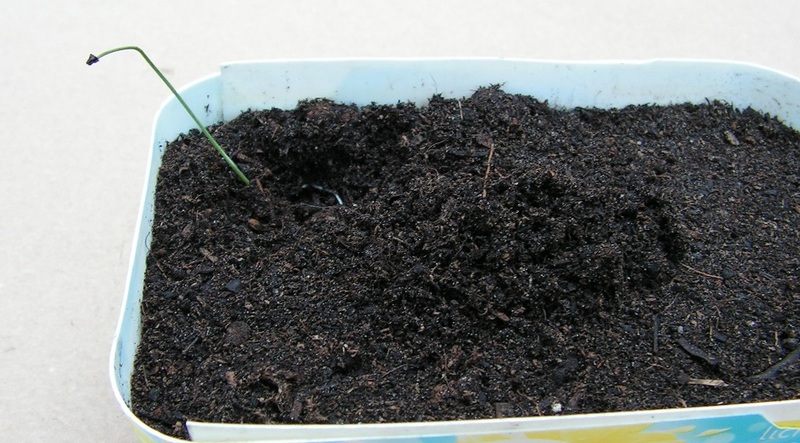 Make in a plastic bucket a mixture of potting soil, dolokal (agricultural lime) and manure. Ratio approx 10:1:1. Crumbled old cow manure. I use cow manure (mixture of straw and cow dung) that was on a heap in my garden for about 1 year. The heap was covered with plastic foil against washing out by rain. This manure does not stink anymore. You can crumble or “break” the manure into small pieces. Dried cow manure fertilizer pellets, to be sold in garden shops. Pulverize the pellets so you can mix the manure with the sowing soil. Fill (square or rectangular) black flower pots with the mixture as far as about 1/8 to 1/4 inch from the top. Put the pots in an ice box. Open the seed bag. Strew some seeds in a crown cap. Lay each time the crown cap in the “empty” pot next to the one you’re sowing in (except of course at the last pot). This to overcome double sowing or no sowing (black seeds on black soil). Use tweezers to sow. Sow in small pots 1 group of 4 seeds. Sow in large pots 2 groups (see photo above) or 3 groups of 4 seeds each. Cover the seeds with potting soil, dry sand fom the garden, dry masonry sand or fine silica sand. Thickness of this layer is 1/8 to 1/4 inch. Water the pots with a soft water spray. Place another ice box on it (upside down). Put elastic bands around the boxes to prevent the top box from shifting or falling. Shift the upper box a little to create a small air opening. Place the whole in a room at approx 68 – 77 F (20 – 25 C). 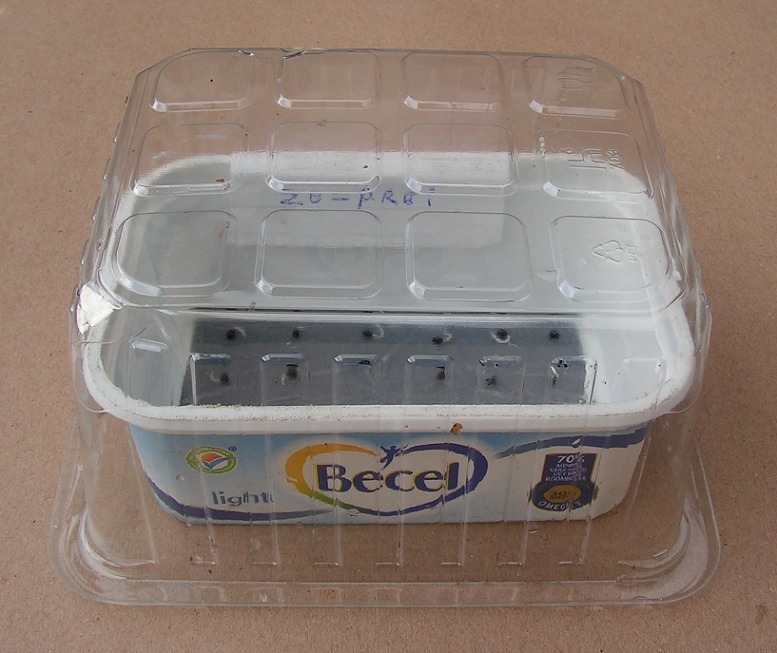 Instead of ice boxes you can also use a “small greenhouse made of margarine boxes”. This greenhouse is described at tip 2. After 7 days at 68 – 77 F (20 – 25 C), first leek plants are visible. Then it’s time to put the pots on a tray before the window. Under the tray I put some stickers made of soft felt. Put the tray(s) with pots indoors before a window towards the sunny side. Each day remove the tray with pots from the window, water the pots with a spray, and put the tray “in the opposite direction” before the window. No damage of the window and a clean window thanks to the soft felt stickers (the tray material doesn’t touch the glass). Water the pots everyday at sunny weather . By turning the tray the plants grow more or less straight up. The pots are black and the tray is low. The sun-beams warm the pots and the soil. This makes the plants grow faster. The pots are in a room with a day temperature of 59 – 72 F (15 – 22 C), such as a bed room, a landing or a living room. Near the window (double pane), the temperature is lower, particularly at cold nights. But in sunlight the pots and soil warm up and this makes the plants grow. 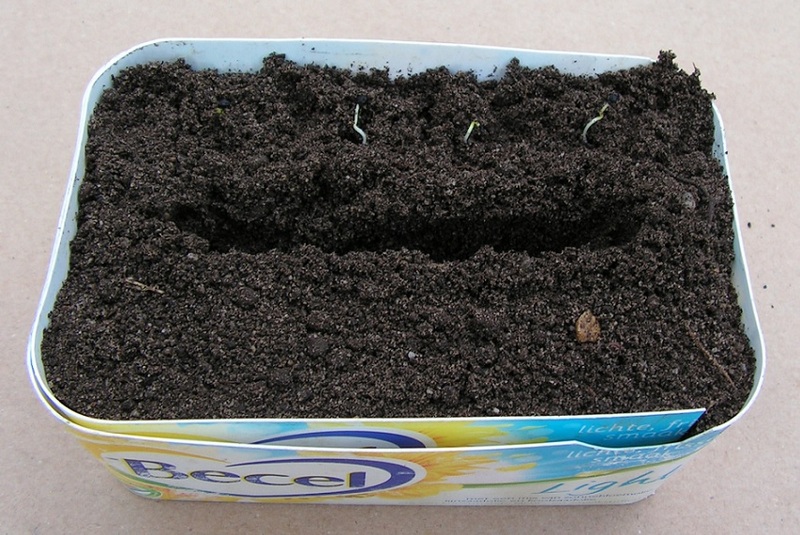 The photo shows 7 pots with leek plants, 2 weeks after sowing. The pots stood indoors before a window at the sunny side for 7 days. I’ve got 43 leek plants out of 56 leek seeds. Thin leek plants at a size of 2 to 4 inch. Carefully pull at each leek plant of a group to feel how “fixed” they grow in the potting soil. Then quietly pull out some small or “loose” leeks of each group. Go on untill one big leek or one “well fixed” plant is left. Rinse the soil after thinning out. When you won’t take any risk, pull leek plants out until 2 plants are left per group. Thin out to 1 plant per group a few weeks later. Put the removed leeks in the compost container (or replant them in pots). Leek plants grow to high and thin plants. They can grow skew or hang down. You can make small supports from plastic plant strips. At tip 2 you find how to make them. This supports helps the leek grow straight up. On these photos you see home grown leeks in small rectangular pots and 4 leeks that I bought in a shop (in black square tray). 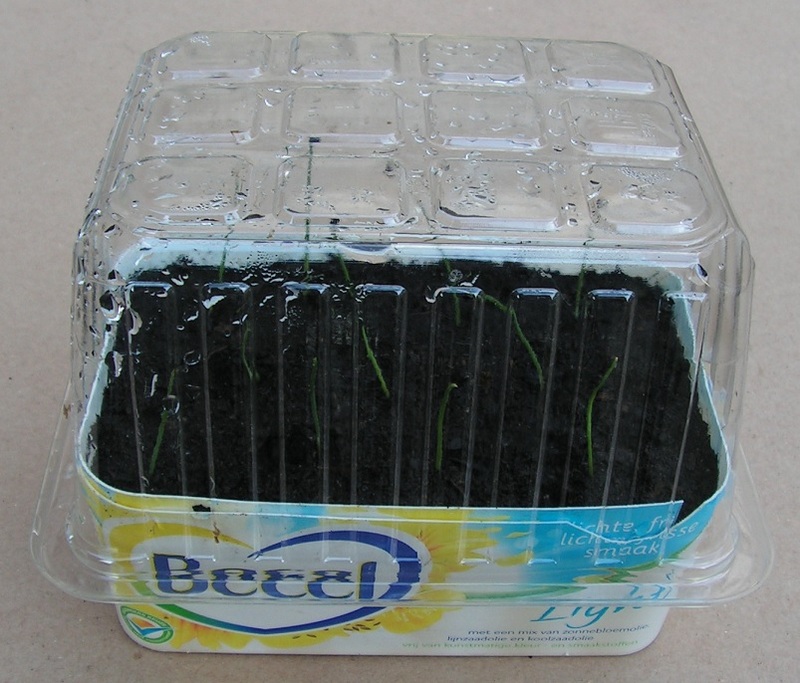 On March 18, I put all “big” leek plants under a tunnel of transparent corrugated plate. On the left side of the phote there are small leeks, sown in the tunnel a few weeks ago. This entry was posted in early, leek. Bookmark the permalink.